I pray that as we gather with family for Thanksgiving, we will all find joy in appreciating one another, not only for those things we share, but for the different worlds we inhabit. This title could preface a post about the election, but that’s not what I want to think about this morning. Rather, I’m thinking about the ways in which I inhabit different worlds as I interact with different people. Grant with the 8 point deer he got yesterday. I’m in Virginia at my parents’ house for Thanksgiving. Dad and my brother Grant are outside butchering one of the three deer they’ve gotten over the last couple days. 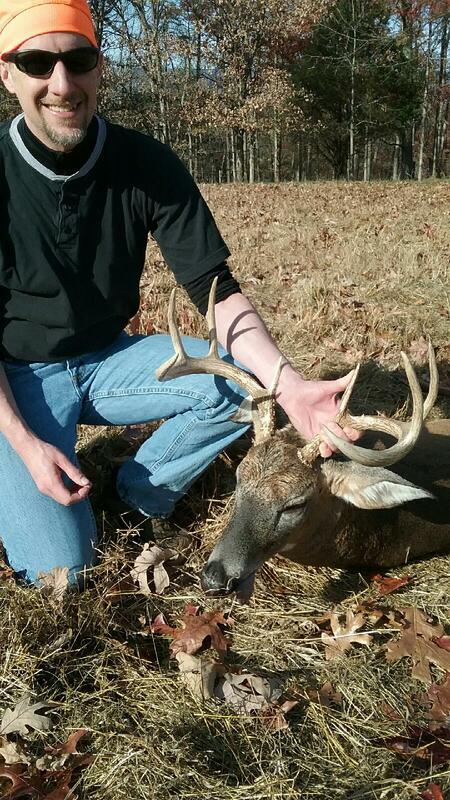 Grant got the largest, an eight point, this year. I tried bear meat this morning with breakfast, from the bear Dad got a year or two ago. (Gristly; I’m not a big fan.) Andrew is eagerly anticipating going squirrel hunting this afternoon and shooting a real gun for the first time, assuming Dad judges him big enough to handle the shotgun without being knocked backwards by the kick when it’s fired. In some ways, this is a very different world from my urban life in Atlanta. I grew up in this world, so it’s not wholly foreign. But when I was 13 and tried hunting, I decided the cold, the patience required, and especially the prospect of having to butcher anything I shot, were reasons to pursue different interests. So now when I’m here, I listen to Dad share hunting stories. I’m glad for the joy he takes in hunting, and the excitement Andrew has about learning to hunt, and I’m eager to see how he reacts to the prospect of learning to butcher anything he shoots. A delicious pie with marmalade, lemon, and coconut layers, made by John. I buy Mrs. Smith's. On the way up to Viriginia, we stopped at the Dermodys’ home. These are long time friends we met while at Notre Dame, where Sandy was in law school with Christina. They lived in Atlanta for several years, and have twin girls Andrew’s age. John and I would often drop them off together at Mothers’ Morning Out (until we got the name changed to Parents’ Morning Out) and then have breakfast at Waffle House. John has embraced the role of stay at home Dad. He is a Vice President on his girls’ PTO, goes to mass every morning at their Catholic school, cooks delicious meals each night, and lays out the girls lunches each morning for them. Grace and Eliazabeth's lunches laid out for them by John. I enjoy juggling the roles of pastor and father, which is good, because it feels like I’m almost constantly juggling. I am serving as treasurer of Andrew’s PTO, but made it very clear I would do just these particular things, and have stuck to them while the rest of the PTO does much more. The boys make their own lunches, and John and I joked about how when they visit us, they get the option of ordering Ethiopian, pizza, or my sticking a Stouffer’s lasagna in the oven. We share a lot of things in common, and still engage our roles as primary parent at home very differently. One of the things we appreciate about the school that Peter attends is that it’s primarily African American. If you don’t know me, you’ve still got a 50-50 chance of guessing whose Dad I am - Peter’s or Bradley’s. A few weeks ago, I took Peter to a birthday party for one of his classmates, and I was the only white adult there. Everyone was super hospitable and engaging, and I was still aware that I was the only white adult there. It was a good experience. A pastor friend of mine co-pastors an intentionally mixed race congregation in English Avenue. Most of the African American congregants live in the neighborhood. While Tim and his family live there as well, many of the white congregants drive in for church. He’s mentioned that for his kids, occasionally being with other white kids feels important, because they are so often the only white kids in their groups: in their neighborhood, at their schools, on the club soccer teams they play on. They very much appreciate the comfort their children have relating to people of all races, but are aware of their minority status. Peter had his birthday party a week and a half ago. We invited his classmates, and so again, the group was primarily African American. As we parents talked, I mentioned again how I appreciate Peter being in a context where we’re the minority, and noted that even the lego robotics people who were entertaining the kids, and who also teach lego robotics as an after school club at Peter’s school, were African American. And then I wondered whether folks thought race or income inequality were greater obstacles to commonality between people. We all seemed to agree it was income inequality. This is another world divide I feel like I often straddle. At AMF, I am surrounded by people who choose to live simply. We also try to make choices that reflect our beliefs that material wealth is not important, but I’m aware that because of Christina’s work as an attorney, we have a lot more money than most people at AMF. Meanwhile, when I’m interacting with other parents who send their children to our boys’ private schools, I’m aware that we are not the most wealthy, and certainly don’t have the trappings of wealth that others do. Our cars are older and were purchased for reliability rather than curb appeal; our house is smaller and also doesn’t have the curb appeal of many of our boys’ classmates’ homes. I find myself both drawing on Christina’s status as a successful attorney to fit in with other successful professionals, and trying to articulate our values of simple living where there is opportunity. I notice myself wanting to apologize for the choices we have made to both groups. I think apologizing in the sense of presenting a justification or defense, as in Christian apologetics, might be appropriate; but I also find myself uncomfortable enough as I straddle these worlds that I am tempted toward the more usual sense of apologizing with a sense of regret for wrongdoing. As I reflected this morning on the different worlds I inhabit, Paul’s comment to the Corinthian church that he had “become all things to all people, so that by all possible means I might save some” came to mind. I don’t generally think in evangelistic terms, that I need to save others to exactly my worldview. But as I straddle these worlds of lifestyle and roles and race and wealth, I do often find myself (at least at my best) both trying to understand and appreciate others, and articulate something of the ways I share and do not share their worlds. I think that’s a good thing. I think some level of discomfort while doing so is a good thing, showing that I’m stretching to see how my worldview fits with or interacts with others’.